Weather, weather forecast, weather channel forecasts weather bydaily & hourlyWeather app is a weather channel which give youbest information about today, tomorrow, 7 days in future. Weatherforecast app let you know weather information exactly.Weatherforecast is very important for life. With a reliable weatherchannel, You will have weather information to prepare yourplan.What is the weather today? You will know the right answer bytouching weather app on your phone. Weather today will be updatedhourly. 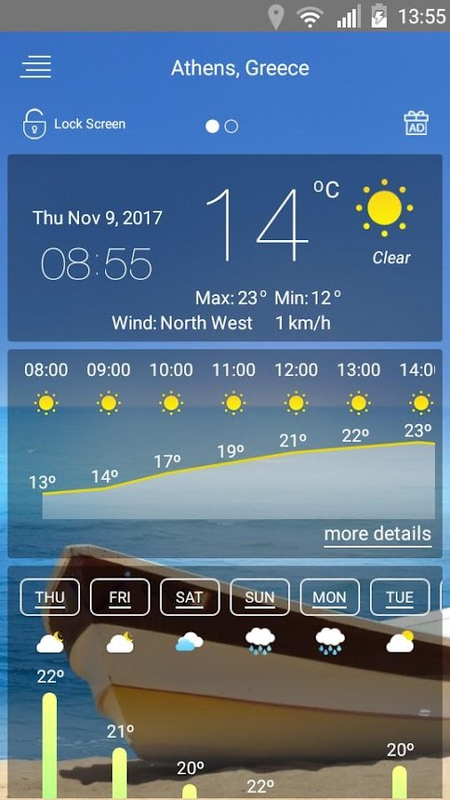 Weather forecast app also has a weather report on weathertomorrow, weather for today, also 7 days in futureWith weatherforecast you can see weather of your location and also you can knowweather of many places on the world. If you are in New York, Youcan see London weather, Paris weather, San Francisco weather,Houston weather...Weather app is very easy to use. Please open app,enable location then you receive the weather forecasts in yourcurrent location.Weather app detects weather forecasts in yourcurrent location automatically. There are many information inweather forcasts which includes atmospheric pressure, weathercondition, visibility distance, relative humidity, precipitation indifferent unites, dew point, wind speed and direction, in additionto ten days future forecast, also hourly weather forecast.Realtimetemperature, humidity, pressure, wind force and wind direction areall in this weather app based.Features:- Free. It is a free Weatherchannel, weather network.- Global. You can see weather in anyplaces you like, ex: London weather, Paris weather, San Franciscoweather, Houston weather- Full report. Displays all information ofweather: location time, temperature, atmospheric pressure, weathercondition, visibility distance, relative humidity, precipitation indifferent unites, dew point, wind speed and direction- Live weatherforecast for free: this weather and climate app offers dailyweather, hourly weather forecasts and monthly weather forecasts.Meanwhile, it also provides interstate travel weather forecasts andforecast weather and wind.- Today, tomorrow, 3 days later, 7 dayslater. Weather for today, tomorrow’s weather, … hourly weather ineach hour.- detect your location by network or GPS.- Manage theweather reports in multiple locations- Multi languages supported-Has weather notifications. If you don't like you can turn off thisfeature- Weather forecast is very accurate and reliable- Sunset andSunrise times.- Shares weather, location information with friends.-Display weather forecast or moon phase- Localized to most of theworld languages.- Chart graphs for hourly weather forecast anddaily weather forecastI hope you have good experience with myweather and weather forecast app. I will update weather forecastapp periodically to make weather app better and better.pleasedownload weather app and use as a weather channel to get weatherinformation hourly and daily. WEATHER for Android. Weather forecast for all the world, satellite,wind & sea, surf, webcams, real time weather, widgets,geolocation. A great app with more than 10.000.000 downloads!NOTES: - widgets aren't available if you install or move this appto SD card; - on multiuser devices, it works only with the defaultuser; - to remove a city from Favorites, long press on it andchoose "Remove" from popup menu; - if you have problems, try firstto uninstall and reinstall, then contact us by mail, thanks. This is pro version:- No ads- Full features- 100% money backguarantee, full refund if not satisfied.Hourly weather is one ofbest free weather apps with full features: Local weather, weathermap and weather widgets.Weather map: Local weather radar app freewith a lot of radar scope: Rain/snow, temperature, pressure, windy,clouds, humidity, waves, … and storm radar.Forecastle: Forecastnow, hourly forecast and daily forecast appWidgets for Android: Theweather radar widget free and clock widget weather with beautifulstyle.Its so easy to receive the weather conditions in your currentlocation.Weather forecast app provides detailed local forecast& weather forecast world wide, the app provides the currenttemperature in Celsius and Fahrenheit, sunrise and sunset timesaccording to city time zone.Weather report also providesatmospheric pressure, weather conditions, visibility distance,relative humidity, precipitation in different unites, dew point,wind speed and direction, in addition to ten days in future andhourly weather forecast.Realtime temperature, humidity, pressureand wind direction are all in the weather app based.App is usingforecastle tiempo data from darksky api, and has backup withaccuweather service, ensure second weather live info fromaccuweather, we plan to add backup with service for weatherbug,service for weatherunderground. Current weather channel provideprediction in minute cast (precise weather in minutes)Features:-The weather channel: temperature, wind, humidity, dew point,precipitation, visibility, pressure, water, sunrise sunset, storm,stormshield, rain alert in one wetter app- Hourly or dailyprediction: we offer 7 days - 10 days info: today’s weather,tomorrow’s weather, … and weather now, hourly weather free in eachhour.- Track the whether in multiple locations- Animated weatherconditions - see how the weather channel comes alive!- Hourly andweekly forecastle, especially hourly weather item for next 7 days.-Sunrise time, sunset time, water time- Temperature free switchingbetween Celsius and Fahrenheit, auto-detect your country should useCelsius or Fahrenheit for default settings.- Wind speed and winddirection in different units- Wind guru tool: wind forecast by windspeed meter, wind finder- 1 day, 10 days future prediction withaccurate el tiempo, plus tempo data for future hour- Weather widgetand ongoing notification with forecast bar, multiple place onwidgets- 360 weather alerts: provide local weather alerts 3 times aday.- Dont need GPS on big cities, its so easy to get betterweather New York, better weather usa for you.- Storm warning &notification: Storm radar, storm tracker, tornado warning and rainalarm - Reporting: wind report, the weather news- Auto reload datafor notification even app is in underground- Weather notificationbar: Keeps weather running underground for realtime- Weather bugreport by using our feedback- World weather report, like newsweather canada, weather UK, weather usa, …- Lot of weather stationby the national weather service (nws) using our nws weather appofficial- Noaa weather app free: It’s noaa weather app officialfrom windyty- Lock screen with info: temp, rain, clouds & clockwidget weatherComing soon:- Multiple services & channels in theweather channel app like: prediction & backup service forweatherbug and for weather underground, for bbc weather, for yr noand yoweather.- My radar app with runtime forecastle, better noaaradar weather apps, noaa forecast & doppler radar now.- Noaaweather radio- Sunrise sunset time in each daily weather item ofnext 7 days- Sunrise calendar & sunset calendar- Remove logo inthe weather radar map- Weather today with push notification: getthe weather watch even app is stoppedDownload accurate weatherhourly right now to plan your trips! Any suggestion & weatherbug reports are also appreciated !